LYNN NOTTAGE is an award-winning writer who is the only woman to have won the prestigious US Pulitzer Prize twice. The first was for her play, ‘Ruined’ (2009), about the effects of war on women from the Democratic Republic of Congo and it had its European premiere at The Almeida directed by Indhu Rubasingham. The second one was for her new play, ‘Sweat’, which won the Pulitzer Prize for Drama in 2017. The show has been performed in the US and is enjoying its European premiere at the Donmar Warehouse. Its run has been extended to February 2, for which you can try for day tickets. In this play, Nottage turns her lens on the effects of globalisation in a ‘rust belt’ city dealing with what she calls the ‘de-industrial revolution’. (The term ‘rust belt’ refers to the decline of an area in economic terms, urban decay and population loss due to the shrinking of the industrial sector). The story is drawn from Nottage’s research with people in Reading, Pennsylvania in 2011 and in her introduction to the playtext, she explains that it was “the poorest city of its size in America, and a microcosm of what was happening to small cities across the United States”. You can hear her discussing it further on the BBC Newsnight clip. (See link below). 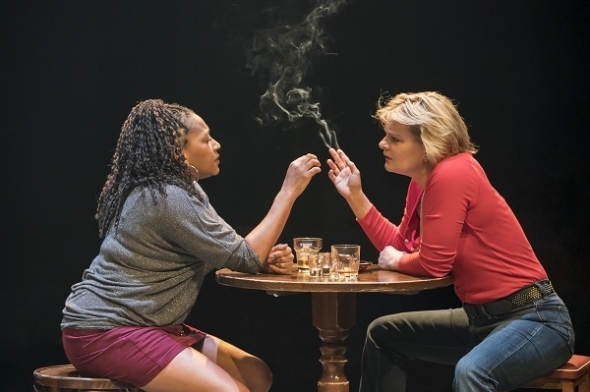 ‘Sweat’ is the story of three friends, ‘Jessie’, an Italian American (Leanne Best), Cynthia, an African American (Clare Perkins) and ‘Tracey’, a white German American (Martha Plimpton), who meet regularly at their local bar after the long shifts at the local steel factory, to drink, smoke, engage in banter and generally have a laugh. ‘Stan’, the bartender (Stuart McQuarrie), is always ready to pour you a gimlet, lend an ear and generally flirt with the ladies. But the winds of change are blowing through the city and no one knows what’s going to happen! Most of the story is set in the year 2000 but it is bookended by scenes from year 2008, when the economic downturn had such an impact, and Tracey and Cynthia’s children are talking to their parole officer. Both of them have suffered as a result of the economic downturn and have had to find alternative ways of making a living. ‘Sweat’, directed by Lynette Linton (who is the incoming artistic director at the Bush Theatre), and designed by Frankie Bradshaw, lulls you into a false sense of security where you think all you are seeing is the day to day after hours social of working people and nothing will happen! One evening, Tracey goes out of the bar to have a cigarette and talks to Oscar, a Columbian American played here by Sebastian Viveros, who tells her that the steel factory is hiring staff (i.e. cheaper labour) and it on this that the story pivots. This is a fabulous encounter as Tracey’s hidden prejudices and sense of entitlement to work are all exposed. At the same time, the factory bosses are promoting people from the shop floor and both Cynthia and Tracey go up for the post and it is Cynthia who gets the job. Tracey assumes Cynthia got the job because “they wanted a minority”, and resentment and racism ruptures the friendship between the women. ‘Sweat’ shows you the impact of free market capitalism and globalisation, where the unions lose power – lock outs happen and labour is constantly being replaced by even cheaper labour. It’s a powerful show and although specifically talking about the American condition, the show could easily be transposed to the UK. ‘Sweat’ is really about the sweat and daily grind of human life and what happens when certainty is replaced by uncertainty. Standing tickets are released at 10am for that day’s performances. Returns are released for sale as they become available. Book online or phone the box office on 020 3282 3808 to check availability. The Donmar has received significant and on-going support for the company’s work from our Principal Sponsor, Barclays for the last 10 years.